"This is an excellent cranberry sauce that is good year round. Buy cranberries in November or December and freeze them so that you can make this sauce throughout the year. The prepared sauce freezes very well." In a medium bowl, mix the cranberries, orange and sugar. Allow the mixture to stand 2 hours. In another medium bowl, dissolve the lemon flavored gelatin in boiling water. Mix in pineapple, celery and pecans. Stir in the cranberry mixture. Pour into containers, and chill at least 4 hours before serving. The best cranberry sauce I have ever had. Highly recommend. This had an interesting flavor to it, but my family didn't really care for it. It tasted good, don't get me wrong. Thanks for the opportunity to try this one out. Terrific and flavorful. This was a big hit here. Will definitely make it again! Thanks for the recipe! This was very tasty! A food processor is a must for the recipe. I would make it again! 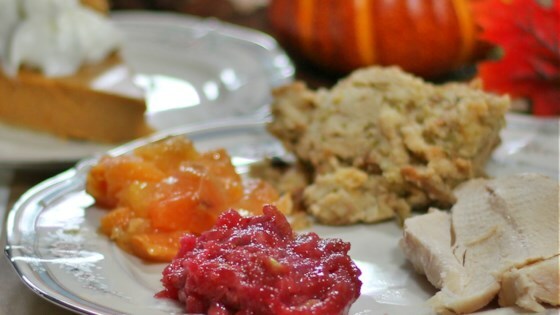 This is the exact recipe my mother used to make every year for Thanksgiving. It is delicious!! A very colorful addition to the table setting.